“(Robert) Rauschenberg: 2nd Week November”. New York: Leo Castelli, 1961 (November 7 – December 5, 1961). Lithograph on heavy paper. Folded as issued. 22 ½ x 17 ½”. 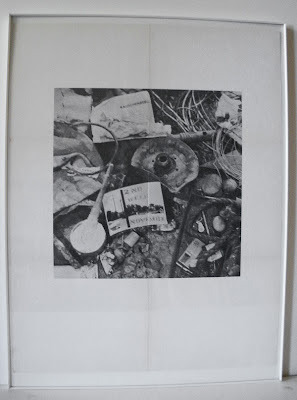 This printing conceived by Rauschenberg from a staged photograph of collaged detritus includes a stenciled photograph-with-the-photograph announcing his second one-person exhibition at Leo Castelli Gallery. According to the Rauschenberg Foundation, this is the first exhibition poster conceived by the artist, however, for Leo Castelli. This exhibition poster — if we can call it that — is created with the same collage tactics also deployed in the works exhibited at Castelli, only here it is a photographic readymade: it succeeds nearly as magnificently, too, falling ambiguously into the void between art and life. Few exhibition announcements come as closely as this one does to nearly absenting itself from the workman-like task of exhibition poster design, one essential task of which is to announce the quotidian details of the exhibition’s place and time. Normally, the viewer is told where and when, but here, instead, he is compelled to become a detective: the name where the exhbition takes place — Castelli Gallery — is truncated to read only as “Castelli,” appearing only on a tiny, torn piece of paper lying inconspicuously among the staged, “found” trash. No precise gallery location or dates are provided (the verso is blank). A seemingly discarded photograph-within-the-photograph is strewn on the ground, however, stenciled with the following cryptic clue: “2nd Week of November”. Nowhere republished in the Rauschenberg literature and previously unknown to us, this very early Castelli publishing effort might be understood to also signal not only Rauschenberg’s passion for printed things, but also the ambitions of the extraordinary Castelli publishing program to follow. Folded, as issued. Mint condition. No time staining. Extremely rare. For reference: the original contact negative used by Rauschenberg to create this exhibition poster is reproduced in Robert Rauschenberg: Photographs 1949-1962, eds. Susan Davidson and David White (DAP: New York, 2011), p. 217.; the contact negative reproduced there was never issued, however, as a discrete “artwork”; this unsigned printing is the work itself.